Roof damage is inflicted by inclement weather like rain, hail, and thunderstorms, but depending on your location, your home’s roof may even have to stand up to extreme storms caused by hurricanes and tornadoes. All this to say – your roof takes the brunt of all that nature has to throw at your home, so making sure it stays in top shape is a priority so that it can continue to protect your family and your assets. The right roofing repair contractors can help you quickly get your damage assessed and have repairs underway as soon as possible. Homeowners insurance very often covers roof repair contractor service after damage from storms and extreme weather, so if you’ve noticed storm damage on your roof there should be no hesitation in contacting roofing repair contractors. Our professional roofing repair contractors can provide you with advice and information after your free consultation that can help you with getting the insurance company to cooperate to quickly get your roof repaired. During a storm, debris from trees or structures can get blown into your house causing damage to the roof. Strong winds alone can damage shingles by pulling them up away from the roof structure and tearing them away. The worst part of all this is that the roof damage usually happens during severe rains which can cause water damage when rain leaks inside of your home, leading to further damage to the internal structures or insulation of your roof, as well as walls, flooring and personal possessions in the home. Hurricane season in Texas usually lasts from June to the end of November and can affect the number of storms hitting the area by sending the remains of coastal hurricanes inland toward Arlington, Dallas and Fort Worth. The tropical storms that these hurricanes become are still often strong enough to cause severe damage and require a roofing repair company to come out and fix the damage, and seal up any leaks in the roof. We repair roof damage covered by homeowner’s insurance. Because roofing repair contractors are often called after particularly bad storms, we prioritize a swift response. We arrive promptly, assess the damage expertly, and then conduct the repairs thoroughly. The worst feeling after a heavy storm is seeing your home damaged so we do our best to alleviate those feelings by offering a roofing repair service that is thoroughly professional, dependable, honest, and hassle-free. We are highly experienced when it comes to working with homeowner’s insurance companies and we will work with them and you to make sure your roof is repaired and ready to stand up to weather for years to come. We are located in Arlington, TX but perform roofing repairs in the entire Dallas Fort Worth area. It’s important to contact a roofing repair company right away to assess the damage before it gets worse. Leaking roofs are a serious structural issue for a home, and the longer they are ignored, the worse the damage gets. Water gets into the leaking roof and can creep down into walls or under roof or ceiling structures. Moisture and water can run down into insulation and wood structures, causing mold and mildew which can result in the need for serious repairs. Contacting the right roofing repair company immediately can save you hundreds or even thousands of dollars in additional repairs. The right company will also give you the satisfaction and peace of mind in knowing that the job was done right, affordable and the repaired roof is durable. Your home is one of your greatest assets. Protect your investment with a solid roof repaired by professional experts. If you see damage on your roof after storms, high winds, or any sort of severe weather, please don’t hesitate to contact us. Completely free, with no obligation, consultation that includes a thorough inspection of your roof’s condition. Your roof is your defense against the elements, so we prioritize a swift response and thorough repairs. We recognize that time is of the essence when you’re dealing with roofing damage and that your home and personal possessions are potentially vulnerable to the weather. Additionally, damaged roofing can cause a serious loss in insulation efficiency and will likely increase your utility bills in addition to making your home uncomfortable during that time. We quickly provide you with a timeline when you contact us and will send out a roofing repair expert to assess any leaks or damage as soon as possible. Once we have assessed any roofing leaks, damage, or other issues, we will provide you with a prompt estimate and advise you on how to provide your insurance company with the information they need to process your claim quickly and get your roof repairs underway. For the 6th year running we have received the Angies list super service award. We are recognized as a Top of the House Certified Preferred Contractor. Our roofing repair experts have undergone the training and assessment needed for Dimensional Contracting to be considered a Certified Energy Expert by Owens Corning. 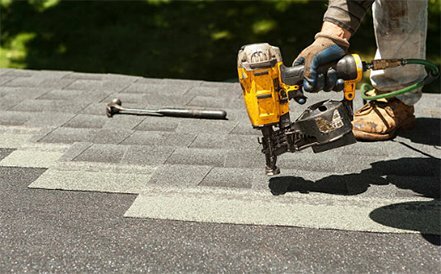 We have the reputation of being one of the best roof repair contractors in Arlington and the Dallas Fort Worth area of Texas. Our business is recognized by the Better Business Bureau and has an A+ rating. Don’t just take our word for it. Read our testimonials and reviews of our roofing repair service from real clients.